Staff at Blackpool Zoo have become the first British team to successfully breed a rare Hartmann's Mountain Zebra in the last nine years. 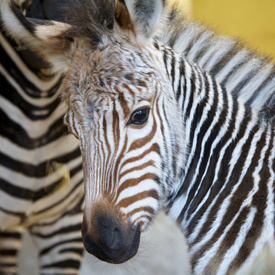 Tebogo is the first Hartmann's Mountain Zebra to be born in Britian for nine years. The foal is also the first of its species to arrive in all of Europe in 2011, with just 12 born around the globe in 2010. 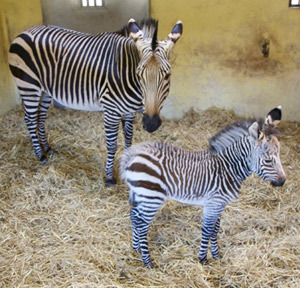 Named Tebogo by his keepers, the new foal takes the number of Hartmann's Mountain Zebras in captivity in the UK to 14. After closely monitoring mother Helene during her 13 month pregnancy, staff arrived for work to find the foal already standing and, within hours, he was suckling. He has since continued to flourish in the first month of his life under the watchful eye of his mother. Blackpool Zoo's senior large ammal keeper, Sofie Haugaard, said zoo staff had been delighted at the successful mating of male zebra Fernando with Helene. 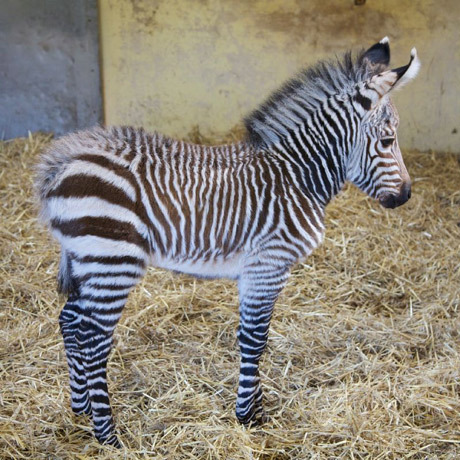 "Hartmann's Mountain Zebra births are extremely rare and it is fantastic to know that we have broken a nine-year absence of new babies in the UK. "Now that Helene and Fernando are accomplished parents we are hoping for the pitter patter of more tiny hooves in the future." Tebogo and his mum, Helene. Tanya Langenhorst, the international studbook keeper and European breeding programme co-ordinator, added: "The birth of this foal is hugely important and wonderful news for the breeding programme and Blackpool Zoo as it adds not only another foal, but two more proven breeders to the European population." The International Union for Conservation of Nature Red List of Threatened Species in 2008 lists Hartmann's Mountain Zebras as vulnerable, with a total population of around 9000. Current studies indicate this number could decline by more than 10 per cent in the next 25 years due to an increase in hunting and loss of natural habitat to agriculture. Hartmann's Mountain Zebras (Equus zebra hartmannae) are native to Namibia and most commonly found in the extremely harsh environmental conditions of the Kunene Region in the North West. They are a subspecies of the Mountain Zebra (Equus zebra), and range from 10 to 14 hands in height. They also have a dewlap. Tebogo takes the number of Hartmann's Mountain Zebras at Blackpool Zoo to four. Eighteen-year-old female Bette shares the paddock with proud parents Helene and Fernando, who are seven and six respectively.